CGPSC Home Department recruitment. CG PSC Home Department ADDPO Exam 2017 online registration ending date is 02/April/2017. Applications will be accepted in online mode only for this CGPSC ADDPO Recruitment 2017. Submit application forms online@ psc.cg.gov.in website. This Sahayak Zila Lok Abhiyojan Adhikari recruitment of CGPSC will be conducted in two stages of Online written examination and Personal Interview. For complete details regarding Chhattisgarh Home Department ADPPO Jobs Recruitment available vacancies, exam pattern, syllabus, application form submission procedure online and more information is given below. 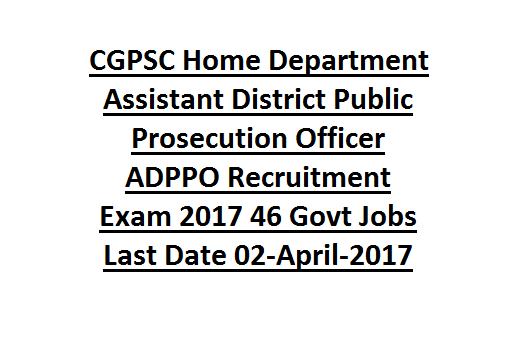 CG PSC District Public Prosecution Officer (Home Department) ADPPO Exam Notification Download here. Selected candidate has to undergo for 2 years probationary period. The candidates must have qualified Law Degree from a recognized university. The candidate's age limits as on 01-01-2017 for General candidates of Chhattisgarh State is 21-40 years. Age relaxations are applicable for female and reserved category candidates. 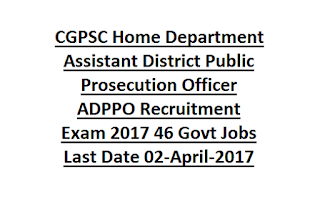 Selection for this CGPSC District Public Prosecution Officer recruitment will be objective type written test and interview. Written Exam will be conducted for 300 marks and interview for 30 marks. Written Exam consist of 2 parts. Total 150 questions will be given and each question carries 2 marks. Exam Duration is 3 hours. Download Exam Syllabus here for Sahayak Zila Lok Abhiyojan Adhikari Recruitment of CG PSC. Interested candidates can apply online @CGPSC website www.psc.cg.gov.in on or before 02-April-2017. Update image and signature scanned copies in given sizes and pay the application fee as per given instructions at the time of online application submission. Click here to apply online for the CHHATTISGARH PSC District Public Prosecution Officer Recruitment Exam 2017. Please share this CHHATTISGARH PSC District Public Prosecution Officer State Police Service Recruitment Examination 2017 article and help others.